Partner with E.A.T.S. 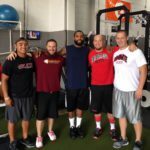 sports performance coaches to develop seasonal or year-round training programs for your team. Return to play with our post-rehabilitation program. We will ensure you return to the game Bigger, Faster, Stronger and Better! Superior training for all: Youth, High School, College/ Pro, and Adults . Training programs designed for athletes of every level. If you selected Sports Performance Training, for what sport?